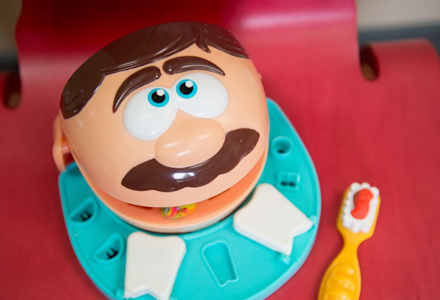 Dr. Serink made a visit to the James Bay Community Preschool to teach the 4 year old class about proper brushing and diet for strong and healthy teeth. Baby teeth are important for chewing, speech development and saving space for developing teeth below, and of course smiling and giggling. Early childhood tooth decay is still a major concern for Canadian children. 40% of kids entering kindergarten will have some active tooth decay present. Early childhood caries (ECC) for kids 71 months (almost age 6) and younger is still the most prevalent chronic disease, five times more than asthma. General anesthesia for dentistry is still the number one use of operating room time at B.C. Children’s Hospital. Have them lie in your lap with you cross legged on the floor with their head tipped up. Have them open big like a lion or shark to try and make it fun. Sing a silly song or tell them you are brushing different coloured sugar bugs off their teeth/ or that you are giving their teeth a bath with lots of bubbles.